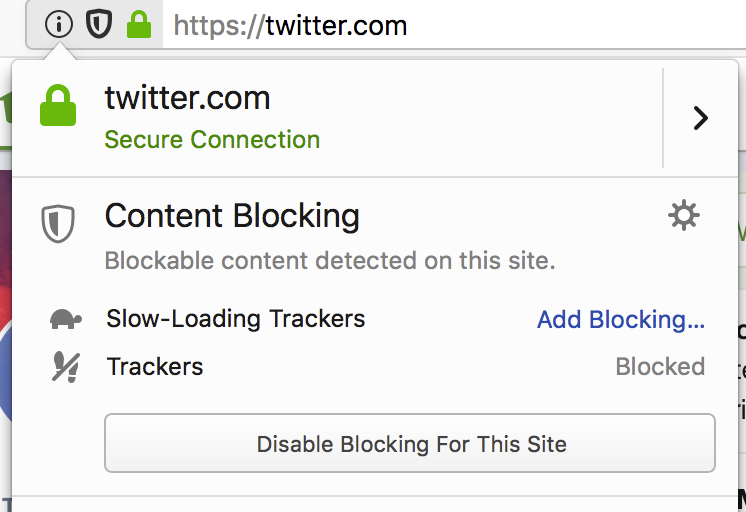 The Tracking Protection UI has been replaced with our new “Content Blocking” UI (almost) everywhere (Metabug). You can check it out in Nightly right now. 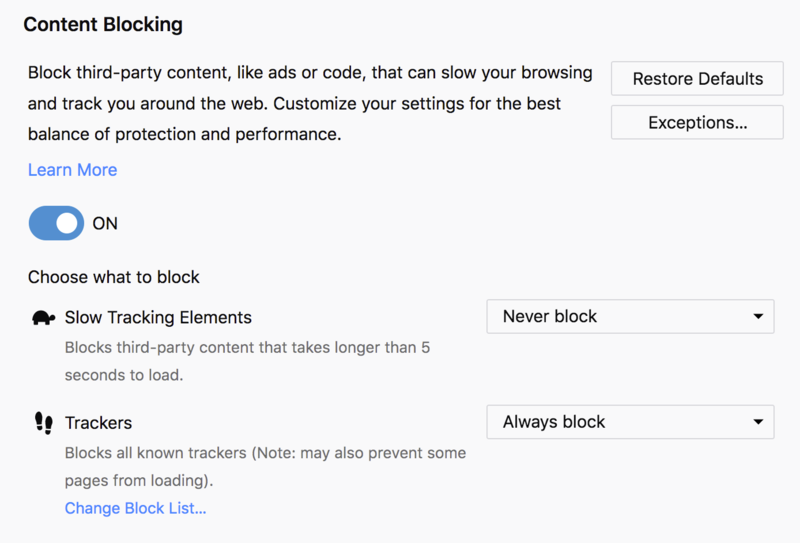 Shiny new controls for Content Blocking in about:preferences! The Identity Panel has been beefed up with Content Blocking powers too. A new special kind of Topsites: Search Topsites. They emphasize to the user the option to search directly from the location bar with different search providers. Based on browser locale, relevant search providers will be pinned in the topsites area. There is also an option to add more search providers or remove them. Save yourself a step, and search directly from the address bar! Clicking these Top Sites will show you how. Clicking on a search topsite will pre-fill the location bar with the provider keyword and you can start searching! Typing @amazon followed by your search query is much faster than typing amazon.com, waiting for the page to load, and then starting your search. 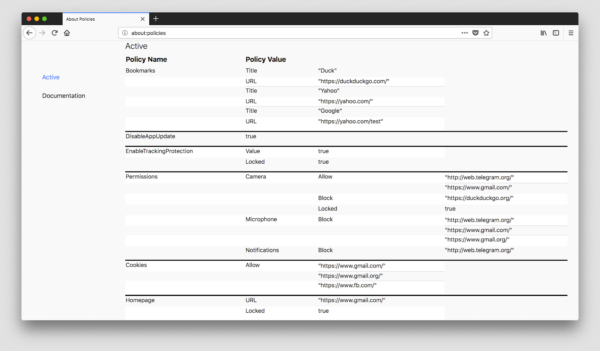 A few issues with the new storage backend for WebExtensions were fixed, and it has been enabled on Nightly by default! This should improve performance for WebExtensions that make heavy use of the storage API – like AdBlock Plus. Thank you to Trisha Gupta for her great work on revamping the user experience on certificate error pages (including a brand new page just for system clock skew). You can try out the new error pages in Nightly and read more about her work in her post to firefox-dev. 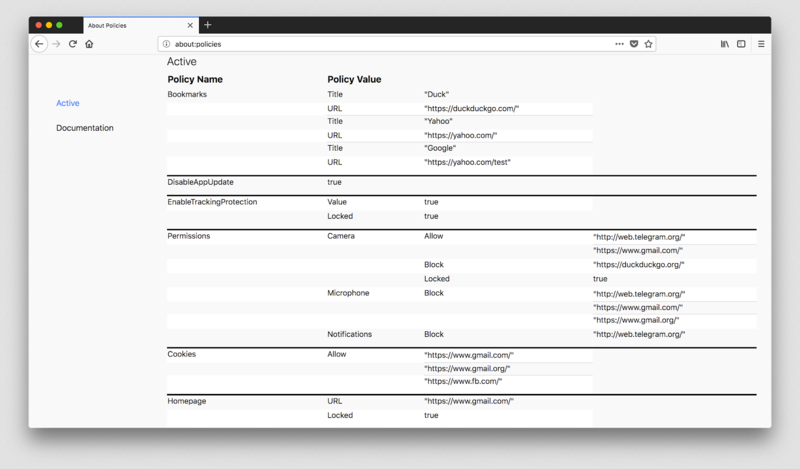 Thank you as well to Kanika Saini for all of her excellent work on the new about:policies page, which should be landing today in Nightly! Advance Test Pilot experiment launched! Check out the blog post to read what that’s all about. Some issues with browser_style and checkboxes were fixed. WebExtension keyboard shortcut handlers and menu onclick handlers can now call other methods that require user input. Inadvertent restrictions on extension managed proxies have been removed. Finished Bug 1369466 – RemotePageManager lazy-fication work! Improved tab reordering performance by avoiding lots of style flushes when moving tabs with the keyboard! Landed a patch to avoid loading WebContentConverter.js too early during startup! We expect, however, that this mostly moves the cost of the flushes to the horizontal overflow flushes. Continuing work on removing about:blank loads for new windows etc. After doing a Shield study we’re landing Firefox Monitor as a system add-on in m-c. You can find the Firefox Monitor metabug here. Lina added a maintenance task to clean up duplicate URLs. Removed nsIDownloadHistory (replaced by an option to PlacesUtils.history.update to add annotations). PlacesUtils.setCharsetForURI has been replaced and a new function implemented which also avoids main thread sync io. Removed PlacesUtils.mobileFolderId (all PlacesUtils. *FolderIds will likely be removed eventually). Send Intern Emily Hou is done with her internship. She did a fabulous job working on the Send 2.0 update. Added branding to the dialog, generic and merchant-supplied error messages, and simple validation. DOM fixes thanks to Eden who has been re-hired! It’s strange that my bug 1479130 appears in “Resolved bugs (excluding employees)” and my bug 1474440 appears in “Add-ons / Web Extensions”, but I’m not listed in “Fixed more than one bug”. And it’s not the first time this happens. Sorry about that Oriol! When WebExtensions moved to their own Product on Bugzilla, the script to generate the contributors wasn’t updated to reflect that. It’s fixed for the future. Yeah, until I want to just Go to Amazon.com and look at Cyber Monday deals and no manner of clicking will just do this. Make the magnifying glass do the searching and the body of the icon go to the real webpage please.